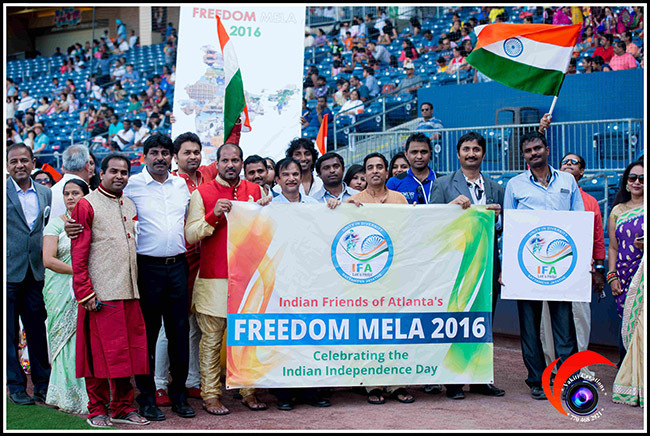 Atlanta, GA: Indian Friends of Atlanta (IFA) organized a spectacular Freedom Mela 2016 at the Gwinnett Braves Stadium on August 6th, to celebrate India’s Independence Day. Thousands thronged to the venue to enjoy the celebrations. The venue was imaginatively decorated to showcase the burgeoning India-US partnership. The sidewalks leading to the entrance to the venue were lined with Indian and U.S. flags. The stadium amphitheater was adorned with large portraits of brave Indian freedom fighters, leaders and historic landmark events of the freedom struggle. Past the concourse was the 1000 feet long Indian tricolor draping the seats from end to end. The decorated Freedom Mela stage, the centerpiece of the spacious stadium sitting on the 2nd base provided a grand spectacle to the audience. More than 70 vendors offered ethnic wear, jewelry, mehndi designs, education and business services, and delectable Indian food. Composed and bubbly emcees Monty, Rhea and Shrivani kept the audience informed and engaged throughout, presenting over 40 non-stop dazzling cultural performances featuring over 700 participants for over five hours by participants from diverse associations and professional dance academies and entertainment groups. Special treats were provided by AATMA Preforming Arts from New York, Mickey Singh, and an illusion show by Mystique. And the cherry on the cake was the magical fireworks with evergreen Indian patriotic songs including Vande Mataram. 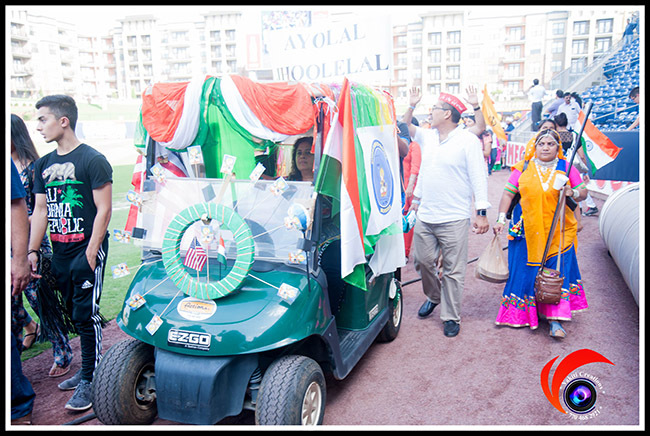 Guests of honor Charlotte Nash and Consul General of India in Atlanta Nagesh Singh hoisted the US and India flags respectively. All joined in singing the U.S. and Indian National anthems with patriotic fervor and lustily shouting Lal Bahadur Shastriji’s slogan, Jai Jawan! Jai Kisan! This was followed by an enthralling performance by over 100 participants. 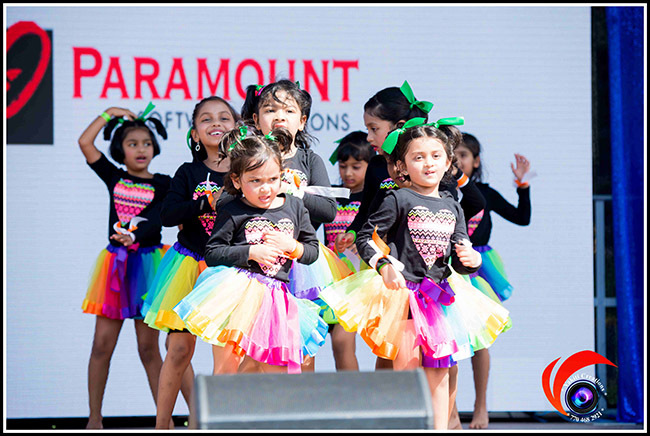 A highlight of the event was the colorful parade by various States of India to the accompaniment of live music from musicians led by Manisharma (famed Tollywood music director). More than 600 people participated in the parade including Gujaratis, Maharashtriyans, Telanganites, Andhraites, Keralites, Tamilians, Rajasthanis, Sindhis, Punjabis, Oriyans and various non-profit groups. It exemplified the rich and diverse culture, the uniqueness, the spirit and the unity of Indian States. This year, there was the extra flavor of floats for the parade. The decorated floats showcased the unique cultural heritage of different States. Kids had plenty of fun to choose from: Camel rides, pony rides, exciting bungee jumps, cotton candy, snow cones, popcorn, stilt walking, face painting and more. This year, there was also the special attraction of helicopter rides. IFA instituted a program to felicitate dance and music teachers ofAtlanta. As part of this program, it felicitated a few of the prominent dance and music teachers ofAtlanta. Jogy K Jose of Divinity Audio Visuals provided great visuals and audio. Vakiti Creations covered the event through his team of photographers. Kathyayini Kosaraju Pinnika beautifully decorated the stage. Bytegraph provided the LED behind the stage. IFA thanked TATA for its help throughout and also for helping out in registration and parade. IFA founding members Sunil Savili, Anil Bodireddy, Shyam Mallavarapu, Sreekanth Uppala, Sairam Pamulapati, Kiran Gogineni and Srinivas Peddi and the IFA executive team Lakshmi Thesam, Abay Radha, Shweta Dhawan, Jamaludheen Masthankhan, Sridevi Ranjit, Sanjeev Akula, Arun Darpally and Ravi Balasubramanian acknowledged all the participating associations, over 200 volunteers, vendors, Gwinnett County, City of Johns Creek, Patel brothers, Suvidha, YuPP TV, Georgia Power, EIS technologies, Orpine, H2K, RapidIT, Dream Realty, Lennar, Pyramid IT, GVR Realty, Cherians, Madhu Tata, Karun Asireddy, Virtue Group, Softpath and other sponsors for supporting Freedom Mela 2016. Special thanks was accorded to King Koduru of Peppers Restaurant for providing food for over 200 volunteers. IFA team said that it wishes to recognize the performers and their parents and the tireless efforts of over 200 volunteers. The team is extremely grateful to Gwinnett Braves Management, Rick Fultz and Ryan Stoltenberg, Lisa Anders of Explore Gwinnett, Shiv’s Institute of Dance and ‘Making your Life’ for providing all the colorful flyers. 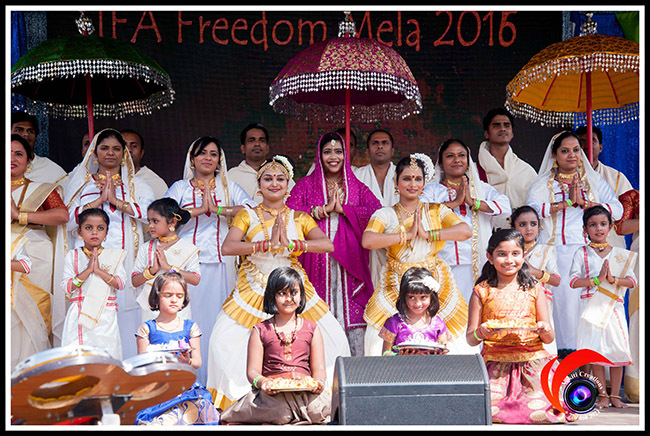 “We are overwhelmed by the support and participation from the community and want to thank each and every one that participated in the Second Freedom Mela and contributed to its grand success,” the IFA team said through a press release.